Because email is a necessary part of everyday life, here are a few email management tools, tips and tricks to be more efficient when reading and responding to the messages flooding your inbox. 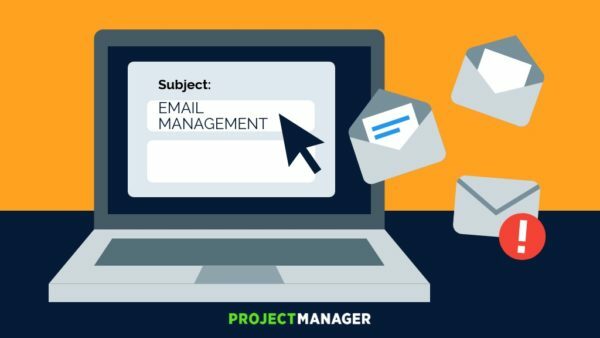 By combining these email management tools with your current work management software, you’re sure to improve your productivity. If your email inbox seems overwhelming, one way to go through it is to treat it like a Band-Aid: do it all at once, quickly, and get it over with. This can either be done manually, by going through your inbox bit by bit, or you can use an email management tool to make it more fun. I recommend emailga.me, which uses a timer and a sad or happy face to help you stay on task and work through email quickly. It connects to your Gmail or Google Apps inbox and allows you to archive messages, as well as forward them. You can also use different sender emails if you have several different emails going to one single Gmail inbox. One under-utilized space to communicate with everyone you email with is your email signature. Of course, it’s common to put information like your phone number or social media networks, but you can also include a line about how you handle your email so expectations are set ahead of time. For instance, when I worked as Executive Editor at Search Engine Journal, I would get hundreds of emails a day. I included a line in my email signature that said something to the effect of: “Emails will be answered in 48 hours during the week. Thanks for your patience.” Since putting that in my email signature, I never had anyone sending me a second email asking to follow-up before I even had a chance to read their first email. It’s very frustrating when people are out of the office and their message says something that is too simple to be useful, such as “I’m out of the office until Thursday, 12/2. Thank you!” Many times, if I am emailing someone, I have a specific need or request. If email is overwhelming you, try using automated services that can present you with a cleaner inbox. Unroll.me is an email subscription and management service. It not only allows you to unsubscribe from several email lists at once (after you connect your email), it also will send you a daily digest of your subscribed emails, so you can look at them all in one email instead of having to manually open and read each one. The other email management tool that truly helps for handling overwhelming email is Sanebox. It automatically puts emails it deems less important in a folder called “SaneLater.” If you don’t want email from a specific person to go into the SaneLater folder, you simply move it back to your inbox, which teaches SaneBox to leave emails from that sender in your inbox going forward. SaneBox does filter some personalized emails from actual people (instead of an email list), but no email has ever been lost. Mail tracking is a very divided issue—some people hate knowing that the sender of the emails they receive will know if they opened it or not, while others swear it helps keep them on track. Depending on what you do for a living, tracking emails can have a wealth of benefits. For business owners, tracking email is helpful if you are sending information about pricing or projects. Someone claiming that they did not receive your email can be detrimental to your income or project status. Thus, being able to see if someone has opened an email can ensure that you know the other people have read it and therefore knows the latest status of the project, or is aware of your proposal cost. MailTrack is one such email management tool that works with Google apps or Gmail and allows you to automatically track all outgoing email sent from the browser the service was installed on (e.g. it won’t track emails that are sent from your gmail app in your phone). Many times, we treat our inboxes as to-do lists. If this is the case for you, it can be helpful to have a service that reminds you about a standing project or action item that was happening through email. Boomerang is one such tool. Once added to your Gmail inbox, it lets you set a boomerang to an outgoing email. This means the email will come back to you on a set date or interval (e.g. in a week). You can choose if the boomerang happens only if the person doesn’t respond or regardless of a response. Finally, no matter what your industry or the topic of your emails, we can all use some reminders on how to write better. Luckily there are tools that can help guide our writing in order to avoid typos and grammar mistakes. The first is Grammarly, which is installed in Chrome as an Extension and has free and premium versions. This tool will automatically scan any inputted text for spelling and grammar errors. If you buy the premium version and have a PC, you can also set up Grammarly to use in Word. Either way, you can also paste text into their online tool to be analyzed. Another great tool is the Just Not Sorry plugin, which works in Gmail or Google Apps in the Chrome browser. This was created to help people avoid unnecessary passive language that many women use in their emails. Phrases like, “I think that” or “please” are underlined, and then the user can hover over it to get an explanation of why it should be removed or edited. By using a combination of these email tools, you can make your inbox management more efficient and take up less time and energy. Treat email management as a task to get through instead of something that can easily take up your entire life. This allows you to work on projects that actually move your business or career forward. Whew, that email problem is finally solved! Now that you’ve managed all those pesky correspondences, how about getting a great tool to help you manage the work itself? ProjectManager.com is a cloud-based project management software that has features like task lists, planning timelines and real-time dashboards that are updated immediately as new information is put into the system. Stay on top of your emails and your projects by taking this free 30-day trial.